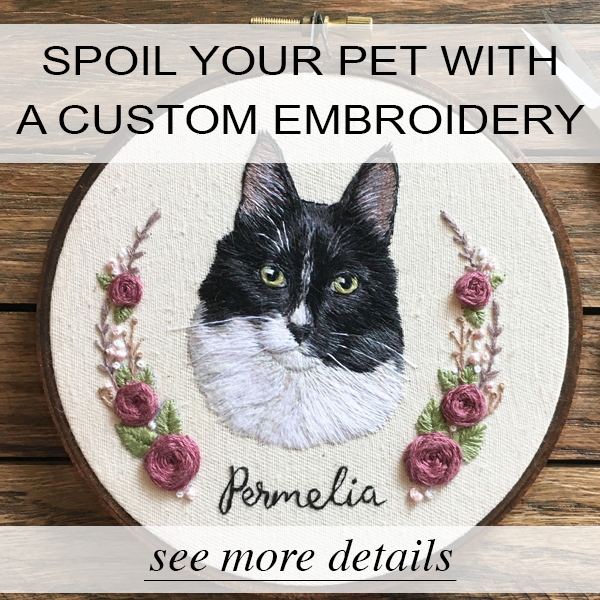 So I’m aware that I’ve already made a tutorial on how I embroider leaves, but I’ve learned so much since then and I thought I would show you more than just a single way to do it! I know there are ‘official’ names for certain stitches in relation to stitching leaves such as maybe the “Raised Fishbone Stitch” or the regular or even the “Fly Stitch” but I’m not really about that. So here’s what I use on the daily. Let’s start by going clockwise and end up in the middle. Scissors: They’re super sharp and really scary and I love them. 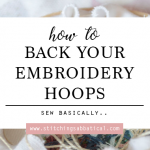 Embroidery Hoop and Fabric: Just the basics. I use Darice embroidery hoops and micro cotton twill fabric. Embroidery floss/thread: DMC is the way to go! Fabric Pen: There are many different kinds of these. Water soluble, permanente, erasable… I use FriXion pens* and they are amazing. They deserve a whole blog post on their own and that will come at a future time. Of course, use whatever you feel comfortable with! The items I’ve listed are just my suggestions based on my own experiences. This is what we’re starting with. I know you’re thinking, “Hey! That’s more than just leaves!” And ya I know – that’s because this is going to be a✨ FOUR PART TUTORIAL ✨ so get excited! But right now we’re just going to focus on the leaves. You can totally draw whatever you want! This is just what I came up with – feel free to copy the design! 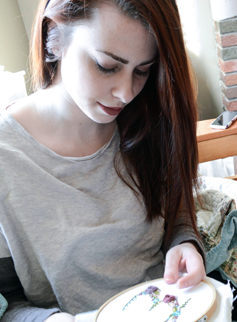 Let’s be embroidery twins! Start by splitting your leaf shape right down the middle with a long stitch. Then make slightly slanted stitches down the side to the bottom of the leaf. Incredibly simple! Let’s see it again on the other side! Here’s our first leaf! The straighter you line up your center stitches, the straighter the middle line will be in the end. Not bad! This one is so easy that I like to call it the “Easy Leaf Stitch”. Woah what happened there? It’s zigzagging all over the place! I like to call this one the “Party Leaf Stitch”. Just draw down your center line, and keep crossing your thread over it. Sometimes this leaf and I party too hard and it doesn’t end up too well, as seen above. It’s really hard to hide your mistakes with this guy. He’s not as chill as the “Easy Leaf Stitch”. It’s okay, real leaves aren’t always perfect either! This is the stitch I featured in my old tutorial. I call it the “Easy Party Leaf Stitch” because basically you combine what you just saw in the first two methods into one stitch. You start by stitching down your center line, and then cross your stitches over it. The Easy Party Leaf Stitch is a little easier to hide mistakes in. Wow look at those leaves! Can you tell which ones I stitched with which method? I can’t. I already forgot. I just know some look okay and some look kinda bad. Here are some embroideries I have made with some cool leaves and flowers. 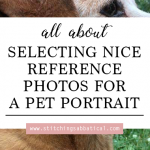 Click to view the full sized images! 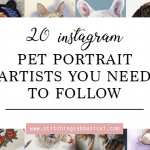 If you found this tutorial helpful and practiced any of these stitches, I’d love to see them! 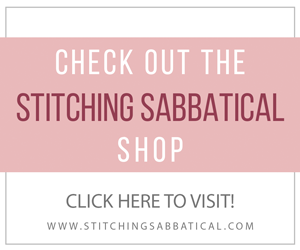 Share your work on Instagram and tag me in your photos @StitchingSabbatical, and use the hashtag #tutorialsabbatical ! 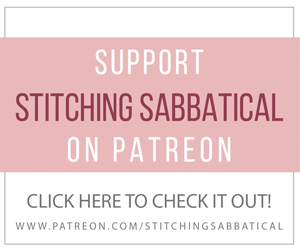 Previous Post: Transferring Embroidery Patterns – Sew Basically..